Let us be honest, the reason why we have this website is down to you. What happens next is also down to you. When it comes to legal advice, we recommend you know who you are dealing with. Please call us to arrange to meet a solicitor face to face. There is no obligation - we are happy for you to just pop in and see us if you wish to do so. We have a friendly office in the lovely town of Lostwithiel, known as the hidden treasure of Cornwall. Otherwise, if you want to find out what we do, who we are and how much we charge, then our website can be helpful. At A P Bassett Solicitors we deal with all sorts of law apart from crime and personal injury. They may be important reasons why people need lawyers, it's just that there isn't much of either in Lostwithiel. What we do deal with is the usual legal High Street stuff like conveyancing, divorce, landlord & tenant, employment, business, wills & probate, estate administration and disputes. We are just a short distance from Liskeard and Looe in South East Cornwall or Fowey and St Austell in the Mid Cornwall area and Bodmin in the north. Alternatively, if you want us to come to you, give us a call on 01208 871485. We offer free home visits to those living in the Lostwithiel area otherwise we charge £50 plus VAT for each visit. 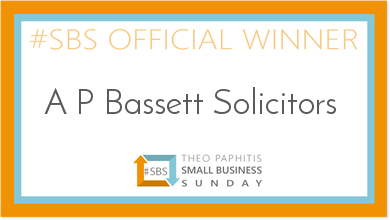 Proud to have been choosen by Theo Paphitis as #SBS winner! Small Business Saturday UK every day of the year! We would like to thank all our clients for their continued custom and support. We really value you and know that without you we are nothing!